Don’t miss the crazy fun for a good cause at Drag Queen Bingo. Come early for burgers and beat the crowd. 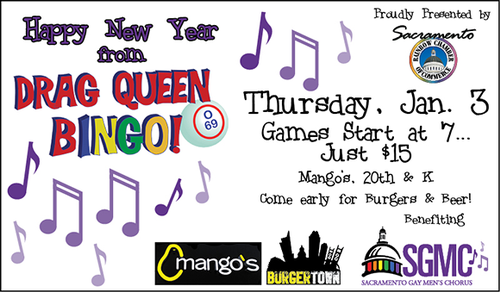 Just $15 to play until 9 p.m., benefiting Sacramento Gay Men's Chorus. Bingo cards go on sale at 6:30 p.m. - we provide free daubers! Come early! We sell out!